Utforsk Bostons kulinariske delikatesser på denne guidede konsertvandringsturen. 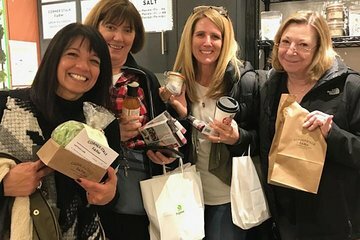 Med en lokal ekspert som leder veien, prøv hummerruller, eplecider-donuts, lønnesirup og mer på Boston Public Market. Lær om den rike matarven fra det historiske lille Italia som du feirer på en italiensk del, smør fersk mozzarella på en gammel skole salumeria , gobble up cannoli. Alle smaksprøver er inkludert i denne morsomme, praktiske og deilige utflukten. Our tour guide Audrey was amazing! She provided rich descriptions of each food we sampled which made each stop special in its own way. This was our first foodie tour and we are already booking our next one! Very dissapointed in this tour. It advertised there were substitutions for the food samples. 4 out of the 5 in our group cannot eat seafood. The substitution for the lobster roll was a can of soda. The substitution for the clam chowder was French onion soup but the tour guide told the waiter no bread or cheese, so they were given onion broth. Very poor for $68 per person ! Tour was fantastic. The trip thru the farmers market was very enjoyable. The guide had us sample several vendors. The chowder was great. Very much enjoyed the trek into little Italy. This tour will not disappoint! This tour stops at so many awesome food places and Audrey is so knowledgeable about each place. You will be full by the time this tour ends. The Boston Public Market is a foodies dream place. So many fantastic shops inside to get just about any type of food. Take this tour!!! We definitely went with the right company, as we went to two restaurants that were on my must visit list. The lobster roll was fantastic - so fresh - and I don't even like lobster. I actually tried 3 things I had never eaten before and all were delicious. Our guide was super knowledgeable and friendly. I would definitely go on another tour with Boston Foodie!